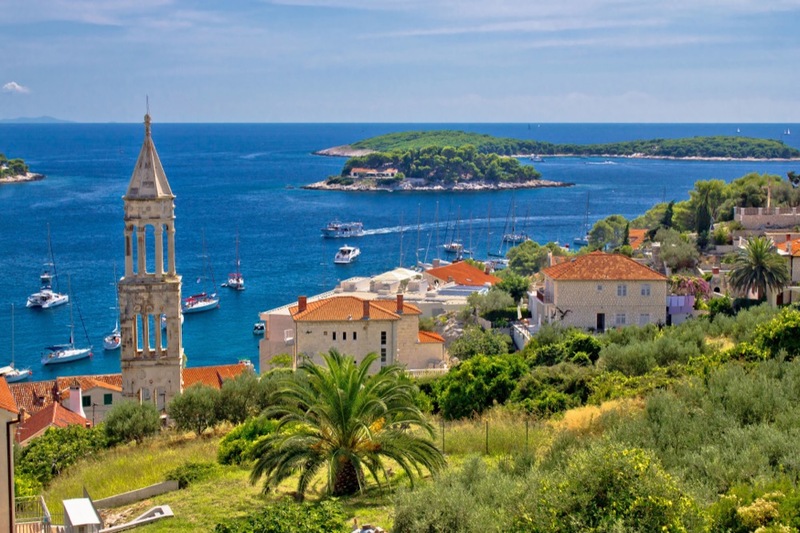 Besides being known as the sunniest Croatian island, Hvar is recognized as a place with a beautiful archipelago of Pakleni Islands right in front of the town. This is a unique archipelago of limestone islands situated a few hundred meters south of the town of Hvar, whose name is derived from bitumen, a thick pine resin used to seal vessels. 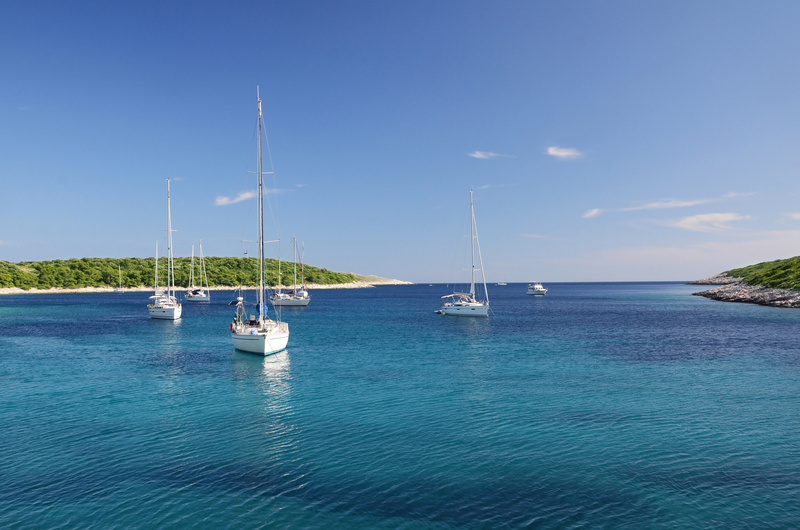 The islands are the most visited part of the Adriatic Sea by the yachtsman population, but are also an essential part of Hvar’s tourist offer. 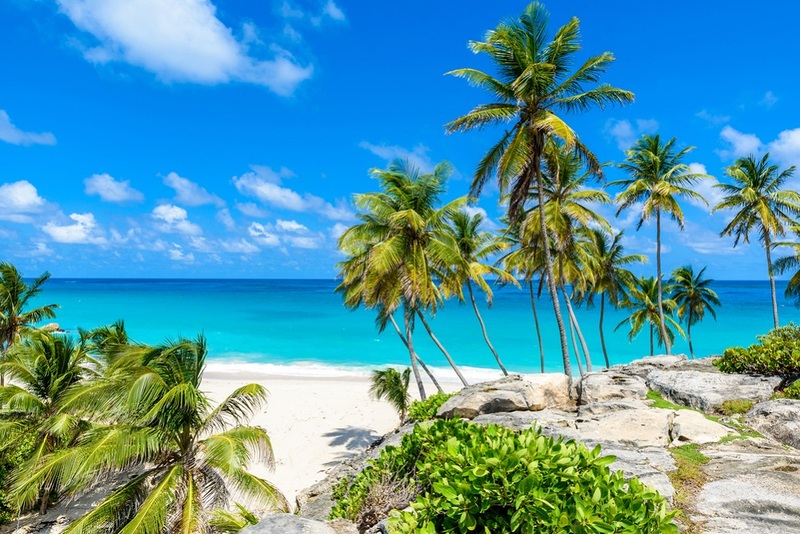 Clear sea, several beaches and resorts and the many secluded bays lure for tourists, who often return to revive their past visits. Moving from east to west, the island of Pokonji dol with a lighthouse of the same name watches at the first Pakleni, called Jerome (Jerolim). On Jerolim there is a famous and long-established naturist beach, equipped with showers and restaurants, just like Stipanska bay on Marinkovac which is also exclusively naturist beach. Stipanska bay hosts the famous club “Carpe Diem” which gathers several thousand people at their summer parties. 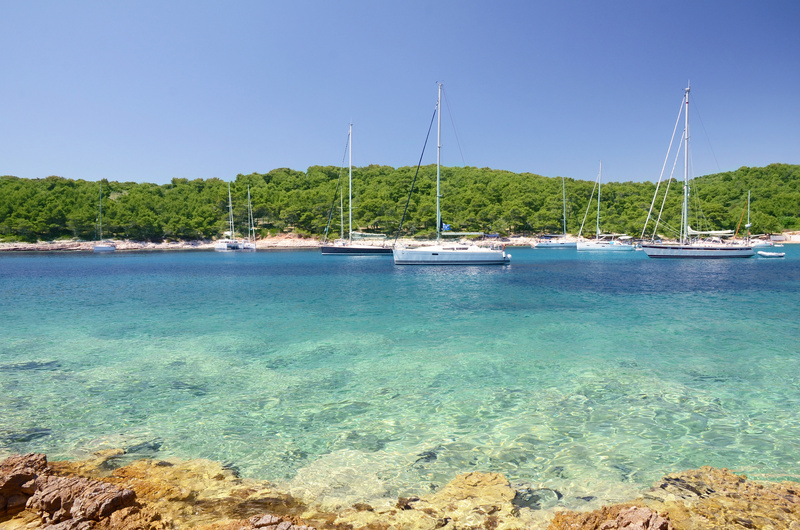 On the other side of Marinkovac is Ždrilca bay, with a few sandy beaches, many secluded places for the relaxed enjoyment of Hvar sun and sea, and restaurants that offer magnificent traditional Dalmatian dishes. For diving enthusiasts, there is a picturesque underwater world as well. However, the most famous and beautiful nautical destination is Palmižana on the island of St. Klement, the largest island in the archipelago. Palmižana is the oldest and most famous Hvar resort, and its tourist image starts with professor Eugen Meneghello, who built the mansion in early 20th century. Eventually, the family started to bring diverse species of plants to the island, creating a rare botanical garden. 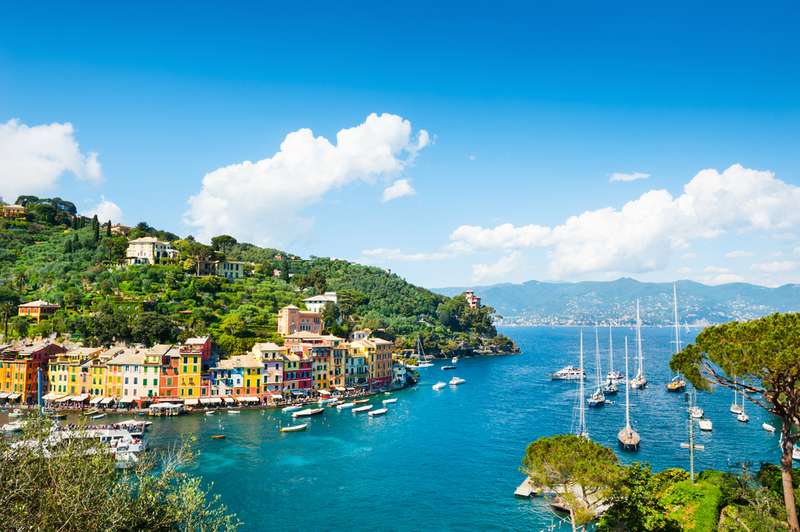 On the northern side of the bay, there is ACI Marina with 160 berths, while the cuisine is perhaps the best in the Adriatic, with its excellent and renowned restaurants. The large bay with a shallow sandy beach is surrounded by a thick pine forest, heather and rosemary bushes, and along with several boarding houses, there is also a store for food and drinks. Taking into account that part of the bay is reserved for those who love the naturist tourism, it’s not a surprise that Palmižana is included in the 10 most beautiful beaches of the Adriatic. ACI Palmižana,Photo Credit: ACI d.d. The most beautiful part of the interior of St. Clement is located above the bay Vlaka in the same settlement, which is seasonally inhabited. Vlaka is a traditional resort on Pakleni Islands and former Roman country estate. There is a church dedicated to St. Clement, which dates from the 16th century, while today Vlaka is a destination for those who want to spend their time sailing in Hvar archipelago with direct contact with the nature and their hosts. A special experience is a fiesta in honor of St. Clement, patron saint of the island, which takes place on the last Sunday in July. At the western end of the archipelago is a group of islands called Vodnjaci. They are known for their exotic underwater world rich in fish, making them a frequent destination for passionate divers and fishermen. On the north side of the islands is Duboka bay with two beautiful beaches and the remains of lime. It should be noted that the safety of navigation around the islands is regulated by several lighthouses, and the navigability between the islands is difficult and dangerous due to strong currents, shoals and numerous islets and reefs. It is recommended to hire an experienced skipper or sail with increased vigilance. 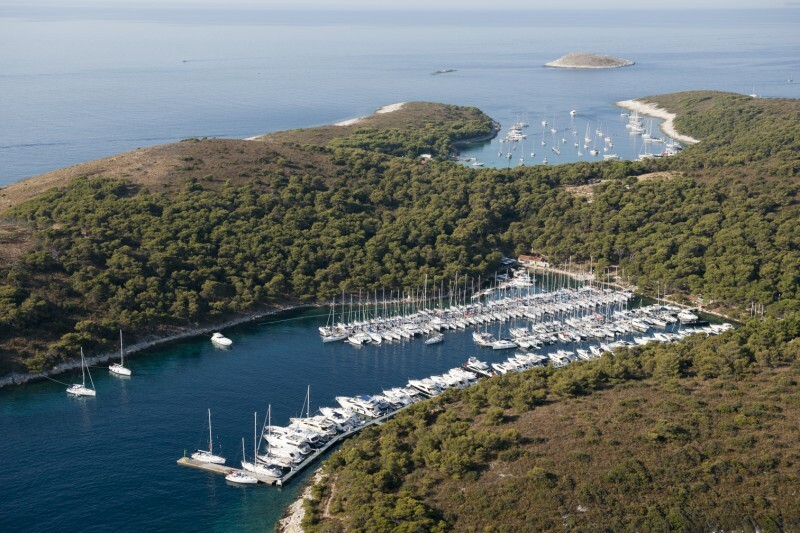 Nonetheless, Pakleni islands are a unique phenomenon of the Adriatic and a must-see for any serious yachtsman!